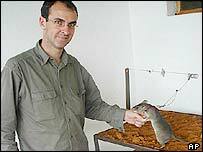 I thought this was a joke at first but a new weapon is being developed in the battle against the millions of unexploded landmines that kill innocent children and adults around the world – the African pouched rat. Ford Mustang Shelby GT unveiled! Huge Firefox crop circle – aliens do prefer Firefox!